For the people of Puerto Rico, the 2018 hurricane season was nothing like the year before. In September 2017, the island was battered by a storm that destroyed at least 70,000 homes, leveled the island’s infrastructure, left 3.3 million people without power, and took too many lives (Figure 1). Hurricane Maria’s impact on Puerto Rico’s health care system was so grievous that a week after the storm made landfall, just 15% of the island’s hospitals were open. 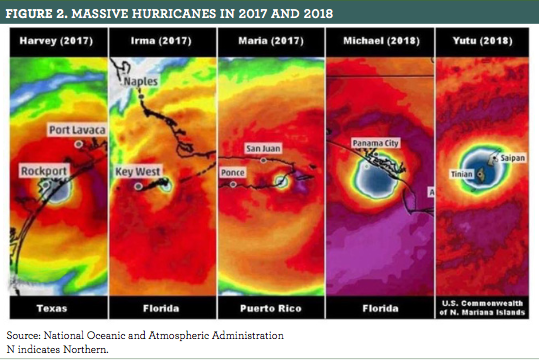 In 2018, the island was spared another category 5 storm; however, we are keenly aware that, given recent climate trends, Puerto Rico—or any other state—could face another “once-in-a-century storm” at any time (Figure 2). That is why we continue to study Hurricane Maria’s impact on health care in Puerto Rico and develop ways to prepare for what might come next. 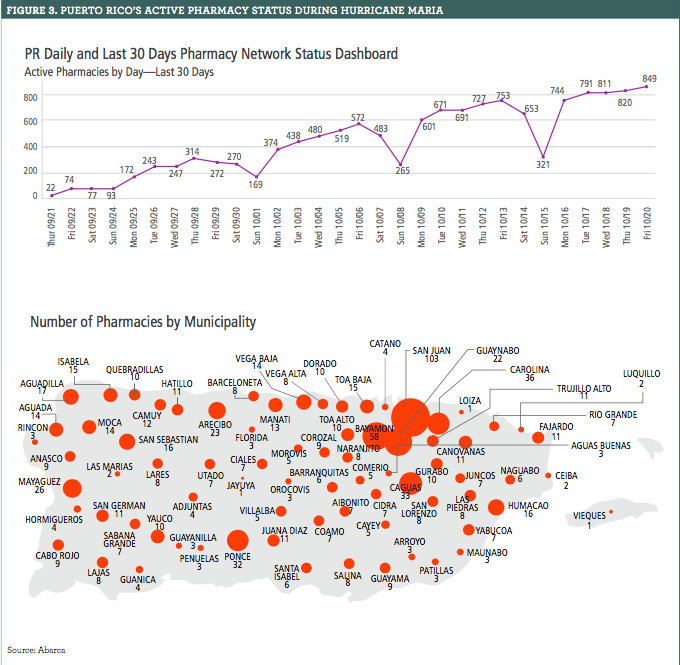 Abarca is the largest Puerto Rico– based pharmacy benefit manager, administering nearly $2 billion annually in drug spend on and off the island. Triple-S, the San Juan–based independent licensee of the Blue Cross Blue Shield Association, provides health coverage to nearly a third of the island’s population. We are in a unique position to conduct this research and feel a deep responsibility to do so. We are all too aware that adherence can be a challenge, even in the best of conditions. In the immediate aftermath of the storm, our teams knew that extraordinary measures would need to be taken to ensure that members could access their medications. Although their families were without power, potable water, and other necessities, Abarca’s clinical staff traveled to more than 200 pharmacies on parts of the island that were most severely affected by the storm. The goal was to determine which staff were able to serve members, provide access to medications, and meet the extraordinary needs in their communities. We also reached out to physicians in the area to verify which patients were in greatest need of support and inform them about where they could have their prescriptions filled. What we found was tragic in many ways. Of the fairly small percentage of pharmacies that were operating, few had access to the internet—a necessity for claims processing—let alone refrigeration or electricity. Puerto Rico’s Network Status Using the information gathered in the field, we developed the Puerto Rico Network Status website (Figure 3), which would become an official resource for the Puerto Rican government. This tool was updated up to 3 times per day to provide consumers with information regarding which pharmacies were open for business and when, among other resources. Our goal was, first and foremost, to intervene wherever we could—1 member at a time, if necessary—to prevent conditions on the island from getting worse. Another concern weighing on our minds was that, as a high-priority client of Abarca and a managed care organization for the island, Triple-S depended on us to sustain a 5-star rating from CMS for their medication therapy management program. This was a significant achievement for a variety of reasons, the most notable of which was ensuring that members experienced the best possible outcomes. We were committed to maintaining that rating despite the devastation on the island. After the storm, we began studying claims data, particularly for medications that treat chronic diseases and that require careful adherence to prevent adverse events (Figure 4). These included drugs for diabetes, hypertension, cancer, rheumatoid arthritis, asthma and chronic obstructive pulmonary disease (COPD), HIV, multiple sclerosis, and hypercholesterolemia. We then plotted the results on a heat map of the island (Figure 5). What we found, perhaps unsurprisingly, was that the falloff in adherence directly tracked the storm’s path across the island, as is revealed by the percentage of asthma and COPD claims, among other conditions. 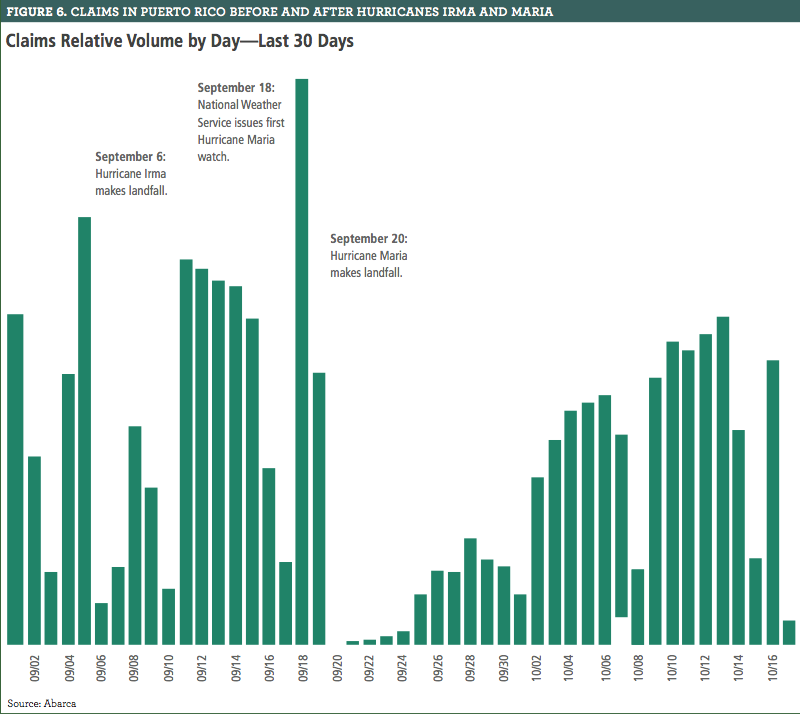 To better qualify the data, it was also essential to study the number of claims across the island in the days leading up to both hurricanes Irma and Maria in 2017 (Figure 6). This confirmed both our assumptions and our worst fears. 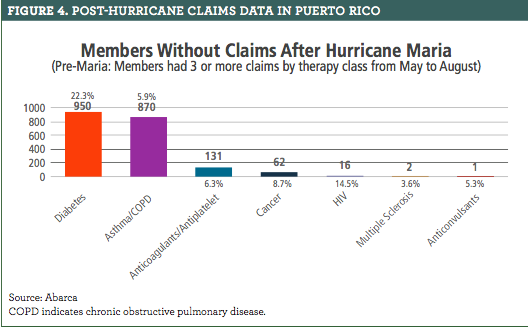 On the days immediately following Hurricane Maria, virtually no claims were submitted, leaving patients medically vulnerable, in addition to other dangers they were facing. We know that there must be a better way. Our reasons for working together and studying the data were not just academic. 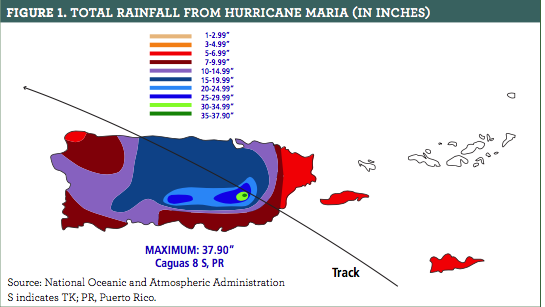 Every year, the resident of Puerto Rico are at a high risk of hurricanes, as are those in the mid-Atlantic, the Gulf Coast, and other parts of mainland United States. Our objective was to improve our ability to prepare for the next disaster. To that end, we created a team of operations and clinical experts to understand what happened after Hurricane Maria and develop a plan for the future. Our primary concern is always accessibility for our members, no matter their location. During Hurricane Maria, our systems experienced no downtime, which needs to be the rule, not the exception. Our telecommunications system is now 100% cloud based, allowing our customer service personnel both on and off the island to stay in constant contact with our clients. To augment this, we developed an internal alert system that, when triggered, will initiate steps to increase our call center capacity by 50%. We have also begun regular internal disaster recovery tests for both our technology and employee communication capabilities. For the latter, we have established a call tree, an emergency hotline, and an automated text program to disseminate information to employees. Thus far, the tests have been successful, resulting in total employee opt-in to our alerts. Although there may be challenges in this chain of contact during an actual emergency, we are taking all the possible precautions to mitigate them and prioritize employee safety. In the aftermath of a catastrophe, many directions can be taken, but for us, there was just 1: to learn. We began learning the instant Hurricane Maria made landfall, and we haven’t stopped. With Triple-S, our efforts not only made an immediate difference across Puerto Rico but also facilitated vast knowledge and the opportunity to make an even more significant impact beyond the island. Although we are still in the process of implementation, the data that we gathered have given us the gift of proactivity. Unfortunately, there is no way to stop a category 5 hurricane, but it doesn’t have to result in catastrophe for patients. By dissecting these data and working together to understand people’s real needs, we can make sure that access, adherence, and outcomes don’t suffer in the face of the storm.